Although many breeds of cattle thrive in the United States, none of them are native to this country. The first cattle were introduced by explorers and settlers from Spain and England. Open range and their meat value eventually created an industry and gave birth to the American cowboy. The state of Florida lays claim to being the first place cattle were introduced in the United States. The explorer Ponce de Leon brought Spanish cattle along on his expedition in 1521, as did Don Diego Maldonado in 1540. Some history scholars believe escaped cattle from these Spanish herds survived in the wild and gave rise to Florida's cattle industry. Organized ranching began in Florida in 1565 at St. Augustine, when herds of cattle were imported from Spain and Cuba. By the 1880s, Florida's cattle herds were a hearty cross between old Spanish and British stock. In 1493, Christopher Columbus brought Spanish cattle to Santo Domingo, in what is known today as the Dominican Republic. 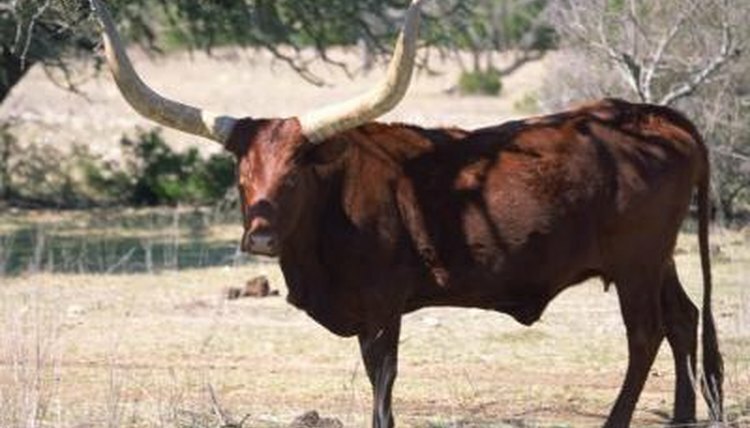 His Spanish cattle were also introduced to Mexico and would eventually become the foundation for the Texas longhorn breed. In 1690, the first herd of 200 head of longhorns was driven north to a mission along the Sabine River, an area that is now part of Texas. When Texas became independent in 1836, the Mexicans returned to the south but left their free-ranging cattle behind. Texas farmers began raising them for their hides and tallow but left them on their own when the Civil War erupted in 1861. By the end of the Civil War, the longhorns had reproduced exponentially and had grown to a population of approximately 5 million head. The Hereford breed of cattle was developed in Hereford, England, in the 1800s. A man named Benjamin Tomkins bred two of his cows to his bull, and the breed evolved from there. They flourished in England and were introduced to the United States in 1817 when Henry Clay imported a small number to his Kentucky farm. Since then, Hereford cattle have become among the most important breeds in American cattle ranching. Two Devon heifers and a bull were imported to the Plymouth colony from Devonshire, England, in 1623. It is the first known importation of English stock to the United States, since up to that time all of the cattle arriving in the New World had come from Spain. The Devon quickly became known as an ideal breed, equally suitable for farm work, dairy production and quality beef. Those cattle eventually evolved into what is now known as the American Devon breed. The American Brahman is the first known breed developed in the United States, from a small herd of Bos cattle that was imported from India in 1854. The Brahman is a sturdy, adaptable and long-living breed, easily recognizable by the large hump between the shoulders.